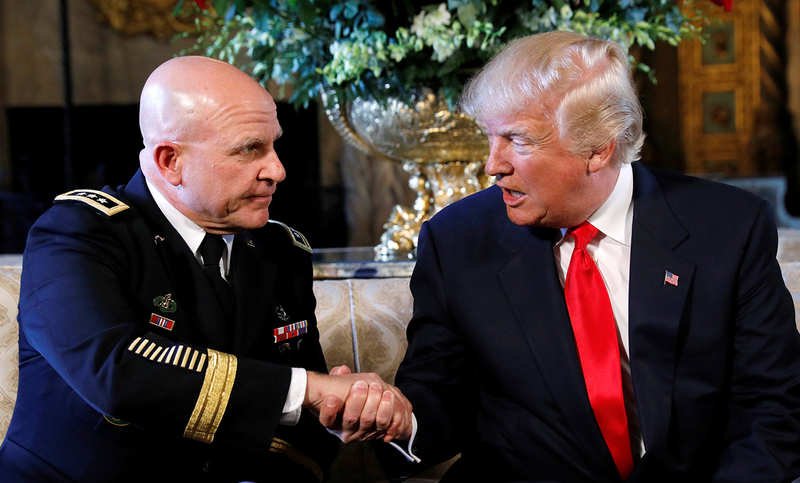 Donald Trump shakes hands with his new National Security Adviser McMaster after making the announcement in Palm Beach, Florida, U.S.
Russians view the appointment of Lt. Gen. H.R. McMaster as Donald Trump’s new national security adviser as a harbinger of a more conservative policy towards Moscow in the near future. Foreign policy experts in Moscow are struggling to understand Herbert Raymond McMaster, Donald Trump’s latest nominee for the position of national security advisor. On Feb. 20, McMaster, a three-star general, replaced Lt. Gen. Michael Flynn, who fell from grace and resigned following accusations that he withheld information from senior administration officials about conversations with Russia’s ambassador to the United States. Some pundits suggest that McMaster’s appointment points to a growing influence of traditional Republican foreign policy views inside the Trump administration and forecasts an increasingly conservative U.S. policy stance towards Russia in coming months. “I’m not ready to say to what extent McMaster shares McCain’s views [on Russia],” said Maxim Suchkov, an expert at the Russian International Affairs Council and a columnist for Al-Monitor's Russia Pulse. Uncertainty about McMaster may stem from the fact that his appointment has been widely praised in mainstream American media outlets and by many prominent figures within the U.S. political establishment who maintain a critical position toward Russia’s foreign policy. Sen. John McCain, who is known in Moscow primarily for his uncompromising stance on Russia, praised McMaster’s appointment despite a previous critique of Trump’s managerial style. In relation to Moscow, McMaster, who has had no known contacts with Russia, appears to be the complete opposite of Flynn, who was widely depicted as the Kremlin’s window into the Trump administration. “McMaster has much more critical views of Russia than Michael Flynn,” said Dmitry Suslov, a professor at the Higher School of Economics and program director at the Valdai Discussion Club. Despite slight anxiety about whether Trump’s cooperative tone on Russia might bend under pressure from military advisors, experts say Russia does not preoccupy the Trump administration so much as to be the key factor in Trump’s decision to appoint a national security adviser who appears tougher on Russia. Indeed, Moscow may receive little attention during meetings in the situation room, according to experts. “James Mattis is a well-read military leader who will not be influenced by panicky accounts of Russian hybrid warfare,” said Michael Kofman, a fellow at the Kennan Institute of the Wilson Center specializing in military analysis. If this is indeed the case, Russia may drop a few spots on the list of U.S. national security priorities. According to Kofman, the military clique in Trump’s team is focused more on Iran than on Russia. “The administration is preoccupied with Iran and ISIS, while Russia probably ranks much lower on the list for the agenda,” he said.